This recipe makes much more chipotle butter than you'll need for the meal here, so keep the rest in the freezer: it's fabulous with roast chicken or grilled fish as well as beef. Flavoured butters are a great thing to have at hand – they really enliven a meal. Remove the steaks from the fridge 2 hours before you intend to start cooking and season liberally with sea salt. To make the chipotle butter, blend the butter, chillies, lemon juice and salt in a food processor. Spoon the butter down the middle of a sheet of greaseproof paper, roll into a 3cm-thick cylinder, twist at either end to seal, and store in the freezer. Preheat a barbecue or grill pan to high. Remove the husks from the corn, brush with olive oil, season with salt and grill for about 10 minutes, turning from time to time, until you get a lovely colour on them – nice and brown but not burnt. Remove from the grill, place in a bowl and cover with cling film to allow the steam to continue to soften them. When they are cool, hold a cob vertically on a chopping board, resting the large end against the board. Take a sharp knife and cut down from top to bottom to remove the kernels, then repeat with all cobs. Place kernels in a small saucepan. Rub the steaks with a little oil. For criss-cross grill marks, place on the grill bars and cook for 3 minutes, then rotate the steaks 90 degrees and cook for a further 3 minutes. Turn over and cook for a further 5 minutes. Place the steaks on a plate, cover with foil to keep warm, and allow to rest for 10 minutes. In the meantime, warm the corn kernels and 80 grams of chipotle butter in the saucepan and swirl until the butter melts, then sprinkle the manchego over the top and finish off with a grind of pepper. Spoon the corn into the middle of 4 large white plates. Place the rib on a chopping board and cut along the bone to remove the majority of the meat, then cut the meat into 4 slices. 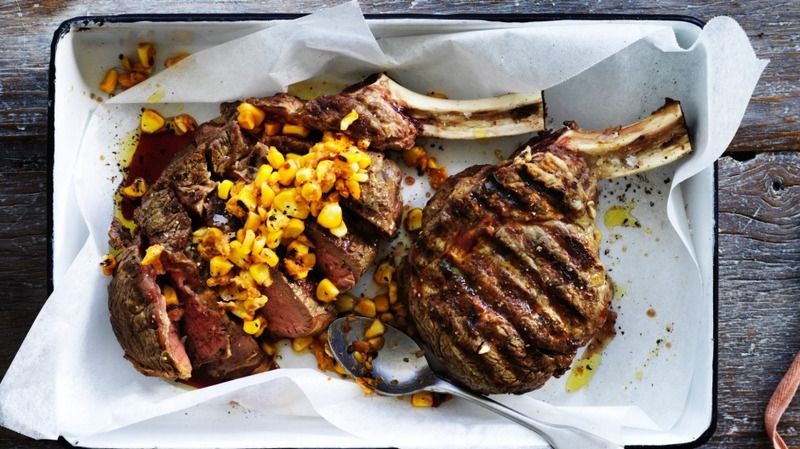 Place the bone and slices on top of the corn on one plate, and repeat for the remaining 3 plates. Sprinkle each with sea salt, a grind of pepper and a little olive oil.